Neighbor Dan got the front brake hoses put back on and the brakes working. 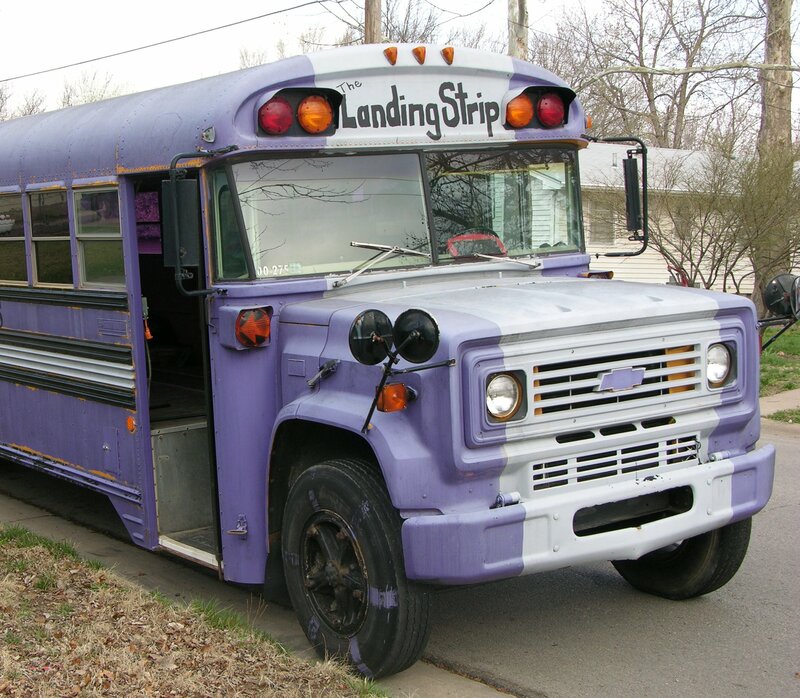 In spite of another brake problem, I drove the bus to my house to work on over spring break, with the two main intentions being removing purple paint and readying the interior for carpet. The first part of the week was non-stop rain, so the paint removal waited until Thursday. It turned out to be fairly effective but still time-consuming, so I didn’t get as much done as I would have liked. 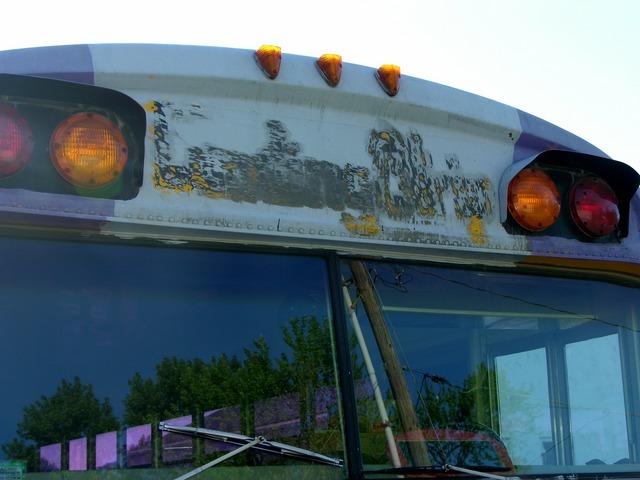 The bus, as you may recall, is covered in purple latex house paint. I’d like to repaint it some other color, but the latex isn’t tough enough (nor was it applied well enough) to paint over. 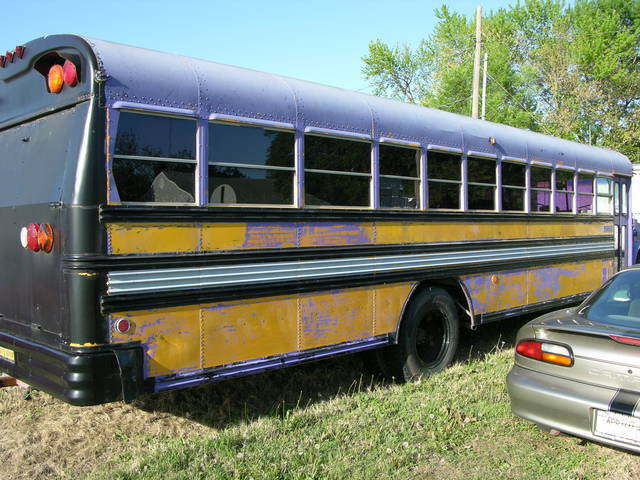 A wire wheel on an angle grinder takes all the paint down to bare metal quickly; but I’ve been looking for an intermediate approach that would get the purple off without forcing me to immediately mask, prime, and paint the whole bus — a significant undertaking for which I’m not ready yet. I recently searched again for a chemical product that might be effective at removing latex while preserving the underlying factory paint job and found Mötsenböcker’s Lift Off latex paint remover. It’s clearly targeted at removing latex spills that haven’t cured yet, but I figured it was worth a shot. It says it can remove latex paint from doors, tables, etc. — things from which you wouldn’t want to strip the original finish — and buried in one of its brochures is the claim that it can remove latex paint spills from cars. Still bearing in mind that it’s probably talking about fresh paint, it seemed worth a look. I see now that it’s available through Ace Hardware, and I’ll try Graber’s for my next jug. But at the time, the only place I found it was through the Home Depot web catalog. It says it’s available for in-store pick-up, but that doesn’t mean it’s available in-store; it means you can pay the full shipping rate to have it sent to the store so you have to drive there yet to pick it up. (I don’t understand people who design web ordering systems and why they don’t spend more time shopping at Amazon.) So I paid $20 for a gallon and about $8 to have it shipped. It smells like bitter apples, it says it’s biodegradable, and it works on years-old latex paint in varying degrees. Some of the paint became as soft as a balloon and I was able to scrape it away in yard-long ribbons, making a perfect division between purple and yellow. Some of the paint didn’t seem to soften much at all. 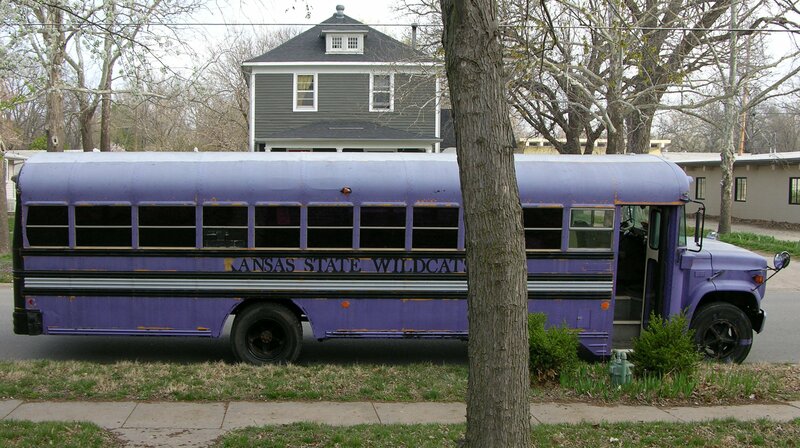 It absolutely and single-handedly made it feasible to strip the purple paint. Scrub the surface clean before you start. Lift Off over dirt just cleans the dirt and doesn’t soften the latex. Put it in a spray bottle. Spray it generously onto the surface, keeping in mind that any runoff is wasted. As soon as it’s dry enough that it’s not running, spray more. My best results were in spots and during times that I was able to keep the surface damp for an hour or more through repeated application. Remove anything that’s not latex before you start. I thought the black lettering was done in latex, but it didn’t soften at all and it prevented the Lift Off from working on the purple paint underneath. I later removed the black paint with a scrubby-abrasive disk on my drill and the Lift Off mostly worked on the purple under it. Don’t expect to scrub the paint off with a sponge or brush. The softest parts came off nicely using a razor scraper. The medium parts came off poorly using a razor scraper. The tough parts came off poorly using the abrasive disk and the drill — but less poorly than without Lift Off. Its effectiveness varied dramatically across different areas, and I haven’t figured out why. It doesn’t seem to correlate directly to sun damage to the latex — the paint on the window stiles is tougher than the paint on the body panels. It does appear to have slightly softened the yellow paint, though not so much as to concern me for my purposes. It was well worth my expense and I expect to use at least two more gallons, on the other side and on the roof. Be responsible and pick up your latex paint. Latex is not a biohazard and Lift Off is biodegradable, so household trash disposal should be fine. I want the bus to be innocuous and not draw attention from vandals; nor turn KSU rivals into vandals; nor draw undue attention from law enforcement, who have a tough job to do, have stressful encounters all day, and can create stress and take up a lot of time even when one is meticulously abiding by the law. So in addition to wanting to be rid of the purple paint, I’ve been eager to get all of the lettering off as soon as possible. While waiting for one application of Lift Off to do its magic, I climbed up onto the housing aft of the hood and sanded the name off of the header above the windshield. It was more black paint, so it had to come off for the Lift Off to work (next time); and it’s good to have it gone already. This entry was posted on Sunday, April 15th, 2012 at 12:20 pm	and is filed under Paint. You can follow any responses to this entry through the RSS 2.0 feed. You can leave a response, or trackback from your own site.